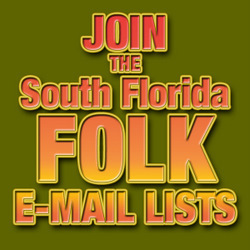 The Gotfolk calendar now covers all of Florida, not only the tri-county area… Please let venues, friends, performers in the central and north florida areas know that the calendar now supports the entire state… We will be having weekly mailing lists for upcoming events for those areas in the near future.. Thanks for being part of the South Florida Folk Community. At the top of your new home page, you promote Mike Stock’s show as being 1-4PM. I believe it’s actually 2-5PM.